The use of a wetting agent to hold soil moisture more evenly through the soil profile could aid nutrient uptake and the efficiency of fertiliser applications, according to Syngenta Technical Manager, Dr Simon Watson. In the latest Syngenta E-Tech Bulletin, he reports the enhanced uptake of nutrients could be responsible for the 'green-up effect' seen during greenkeepers' user trials with Qualibra; where treated areas have responded with a rapid visual improvement in colour. "The use of Qualibra could provide a combination of greater immediate nutrient availability for the plant from better contact of soil moisture along the root and, over the longer term, increased retention of nutrients in the root zone," he advised. 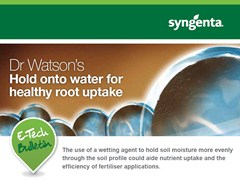 New Syngenta turf research is looking to assess the effect of soil moisture being distributed more evenly through the soil profile, and thereby increasing the area of root contact with soil water containing nutrients. "Where roots are growing in hydrophobic soils - or even small pockets of hydrophobicity within the soil profile - there will be lengths of the root that have little or no contact with soil moisture," warned Dr Watson. "Where the use of Qualibra creates a more even distribution of soil moisture in hydrophobic areas, and thereby along a greater length of the root mass, it should lead to a greater nutrient uptake. Even in a wet season the issue of hydrophobicity can still lead to dry patches within the soil profile." He added that to achieve the desired even spread, Qualibra contains a combination of penetrant to move the water and achieve the spread along the roots and through hydrophobic soils, along with effective polymer retention of moisture right through the root zone. A conventional polymer wetting agent is unlikely to provide sufficient even distribution of moisture to achieve such a significant benefit. Secondly, with soil moisture being held more effectively deeper in the soil profile Dr Watson pointed out there would be a reduced leaching of nutrients, which results in more available for root uptake and increasing the efficiency of fertiliser applications. This would also have an implication for the environmental impact of nutrient loss through groundwater. The reason turf typically starts to yellow off in the summer is not lack of water, but most likely lack of nitrogen, according to Dr Watson. 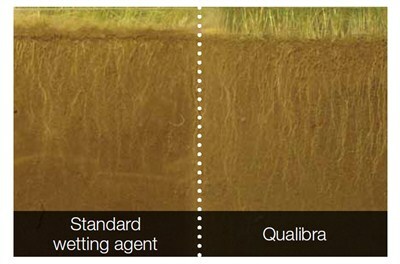 Since N in soluble form is only available in water, where Qualibra makes moisture more accessible in the soil, it should lead to greater uptake and greater availability in the plant; thus delaying the onset of summer senescence or, where plants have started to suffer, alleviating the symptoms quicker. 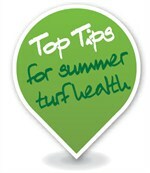 "If we can better retain the root structure over the summer - through any combination of actions including Qualibra wetting agent programmes, raising the height of cut, aeration, irrigation, nutrition and Primo Maxx - it should also enhance overall plant health," he said. Click here or on the iamge below to read the latest Dr Watson's E-Tech Bulletin with the full story of Qualibra use to enhance nutrient uptake.